Mardhiah Sumayyah Binti Mohd Amin is a lawyer since February 21,2013 currently practicing in Rushdi Yusop & Partners, Dungun branch, Terengganu. 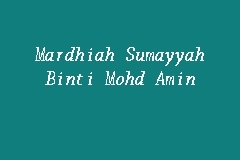 You may reach Mardhiah Sumayyah Binti Mohd Amin at 09-8484006 , 09-8484944. You may try to ask for Mardhiah Sumayyah Binti Mohd Amin's help, especially in matters related to cases in Mahkamah Majistret Sivil Kuala Terengganu. Mardhiah Sumayyah Binti Mohd Amin has worked in RUSHDI YUSOP & PARTNERS before too.